Hall effect position sensors with on-chip analog-to-digital conversion (ADC) lend themselves to very tiny systems. Using a novel implementation of these integrated linear position sensors, engineers at New Scale Technologies created a unique off-axis rotary position sensor that delivers absolute angular position information over a standard I2C serial digital interface. This sensor has a wide clear aperture, very small size and low power use. Coupled with New Scale’s tiny piezoelectric motors, it enables highly-miniaturized optical systems. Figure 1: On-axis rotary position sensor for absolute angular measurement. Hall effect position sensors with on-chip analog-to-digital conversion (ADC) lend themselves to very tiny systems. Using a novel implementation of these integrated linear position sensors, engineers at New Scale Technologies created a unique off-axis rotary position sensor that delivers absolute angular position information over a standard I2C serial digital interface. This sensor has a wide clear aperture, very small size and low power use. 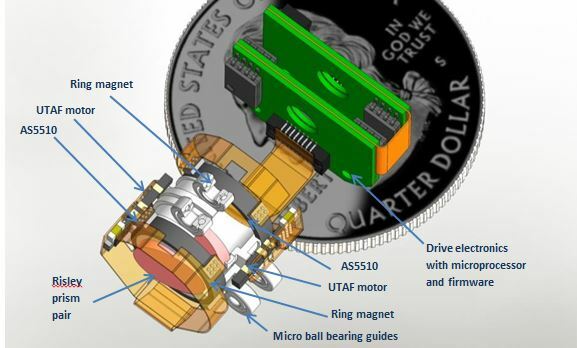 Coupled with New Scale’s tiny piezoelectric motors, it enabled us to develop a highly-miniaturized Risley device for precise laser beam steering and has many other applications. Rotary Hall effect position sensors have either on-axis or off-axis configuration. In an on-axis configuration, a sensor array is mounted in front of a simple two-pole disc magnet, usually mounted on the rotating shaft, centered on the axis of rotation (figure 1). With a two-pole magnet, the sensor array can deliver absolute angular information. An example is the ams AS5048, which incorporates an array of Hall effect elements and integrated ADC. It provides absolute angular measurement over 360° with a resolution of 14 bits (16,384 positions per revolution). The zero position can be programmed into the device. With the on-chip ADC, the absolute angular position of the magnet is provided as a digital value on the SPI serial interface. Figure 2: Off-axis rotary position sensor provides incremental angular measurement. Many optical applications require an off-axis sensor configuration to leave a clear aperture for light transmission through the center of a rotating optical element, which may be a polarizing optic, a micro filter wheel, a wedged prism or other component. This can be achieved using a ring-shaped multi-pole magnet coupled with a Hall effect sensor array such as the ams NSE5310. The magnet is mounted near the outer circumference of the optical element, and the sensor is positioned above or below the magnet (figure 2). With a multi-pole magnet, the NSE5310 provides an incremental output with 256 pulses per pole period. An index pulse is generated once for every pole pair. On-chip ADC provides 12-bit absolute position information within any 2-mm-long pole pair, with a resolution of 0.488 µm over the length of the pole pair. However, the multi-pole magnet yields relative position information only. It is necessary to program a zero reference point and use a system processor to count pole pairs to determine the absolute position over the entire 360 degrees. The power must remain on to maintain absolute position information. After power-down or sleep, an incremental sensor must be re-homed by moving it to the zero position and restarting the pole crossing count. This is undesirable in many applications, especially portable devices, where it is essential to minimize power use but also maintain absolute position information. To achieve absolute angle measurement with an off-axis position sensor, New Scale Technologies designed a novel two-pole ring magnet and coupled it with four AS5510 linear position sensors from ams. Each AS5510 contains one Hall effect sensor with integrated on-chip ADC in a tiny 1.46 x 1.1 mm chip scale package. A two-wire I²C serial interface provides absolute digital position output. 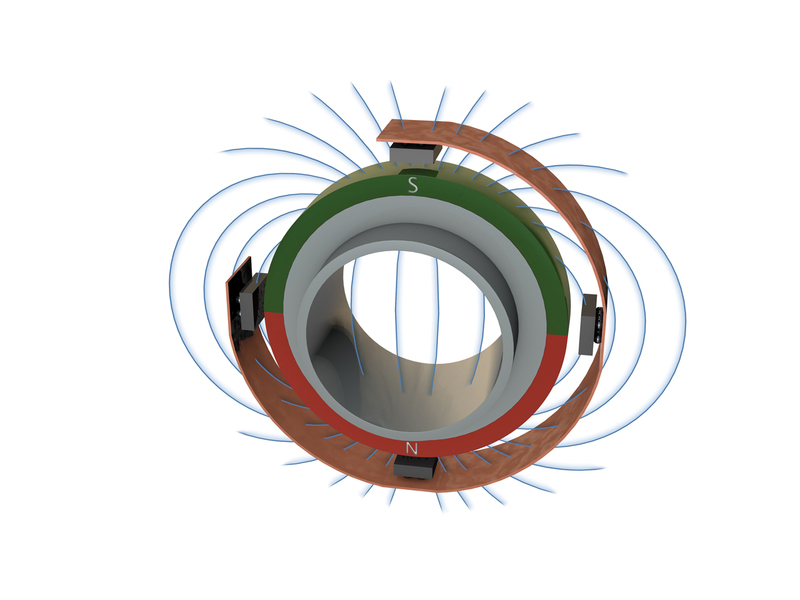 The design incorporates a rotating, diametrically-poled ring magnet and at least two sensors mounted near the periphery of the magnet. 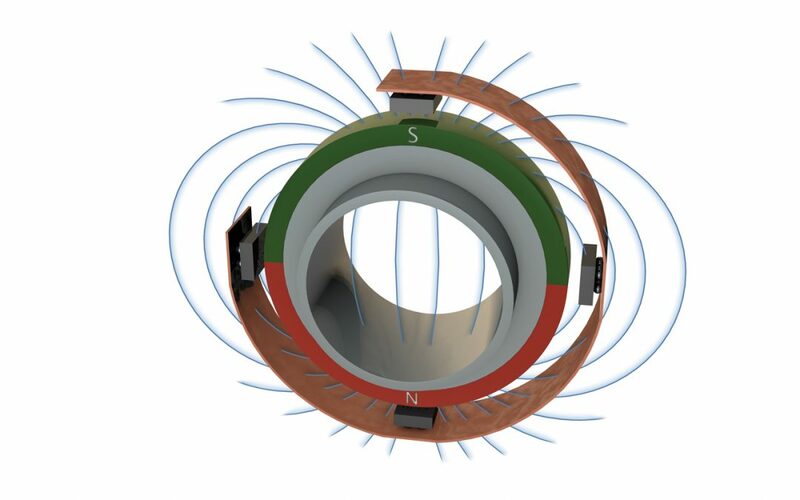 The sensors are oriented to detect the radial component of the magnetic flux emanating from the magnet (figure 3). Figure 3: Off-axis rotary position sensor with absolute angular measurement developed by New Scale Technologies. As the magnet rotates, each sensor detects a change in field strength. 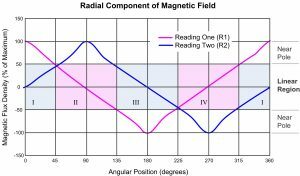 Except near the poles of the magnet, the angular position is an approximately linear function of the sensor reading. 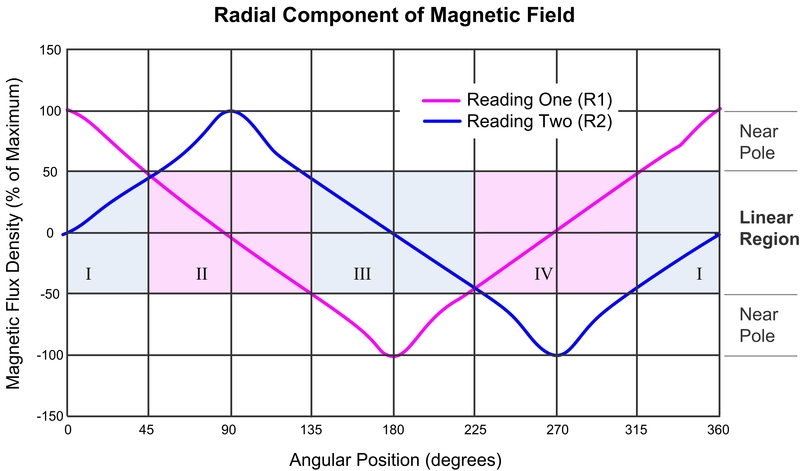 The two orthogonally-placed sensors ensure that every angular position of the magnet can be determined as a linear function of at least one sensor reading (Figure 4). Figure 4: Two orthogonally-positioned sensors can determine every angular position of the ring magnet as a linear function of at least one sensor reading. To determine position, the magnet is considered to have four quadrants. Using the two orthogonal sensors, each sensor reading is used for two of the quadrants. The quadrant of the current position can be determined by comparing the two sensor readings, with and without sign (figure 5). Figure 5: The quadrant of the current position is determined by comparing the actual and absolute values of the two sensors. The angles at which R1 = R2 or |R1| = |R2| are at the transitions between quadrants. In these cases, either quadrant may be used to calculate the angle. Calculating the absolute angular position from the magnetic flux reading requires two coefficients: slope and offset. Ideally, the magnitude of the slope will be equal in each quadrant and all offsets will be multiples of 90°. However, to accommodate tolerances, it may be necessary to determine distinct coefficients for each region. Any two points where flux density and angle are both known is sufficient for this purpose; the positions where |R1| = |R2| are convenient. Using the I2C interface, the system microprocessor addresses sensor 1 and takes its flux density reading, addresses sensor 2 and takes its flux density reading, compares the two sensor readings to determine the current quadrant, and finally calculates the absolute angular position using stored coefficients for the quadrant. While a single pair of sensors is sufficient to obtain absolute position information, additional sensors improve performance. In our design, diametrically opposed sensors are used differentially to improve immunity to external magnetic fields and reduce error due to mechanical misalignment and radial run-out. The original application of this position sensor was in a miniaturized Risley device for laser beam steering in a surgical endoscope. Our design required very small size, wide clear aperture and low power use. We chose the AS5510 for its small size and on-chip ADC, which eliminates the need for external ADC circuitry and enabled us to achieve very small system size. The I2C interface allows us to easily address and read multiple sensors. It also provides programmable gain selection, allowing us to optimize performance for actual field strength based on the magnet material and the gap between the magnet and sensor. The device has 10-bit digital output resolution and low power use. A Risley device consists of two wedged prisms which, when rotated separately, steer an incident beam over a continuous range of directions (figure 6). It has smaller size, lower power use and less weight than a gimbal system and offers maximum beam transmission, faster response and greater optical and mechanical simplicity. Figure 6: A Risley device consists of two wedged prisms which, when rotated separately, steer an incident beam over a continuous range of directions. We developed micro ball bearing guides to support the prisms with very low friction and wobble. A New Scale Technologies UTAF piezoelectric ultrasonic motor is frictionally coupled to the outside diameter of each prism, producing continuous bi-directional rotation with +/- 0.35 degree resolution, +/- 2 degree accuracy, and no backlash. Each motor measures only 0.7 x 0.8 x4.5 mm, enabling a highly miniaturized beam positioning device that is only a few millimeters larger than the diameter of the optics (figure 7). Figure 7: Miniature off-axis absolute position sensor and UTAF piezo motor enable closed-loop control of a Risley prism pair. All drive electronics fit within an endoscope head and communicate over an I2C interface. Both the UTAF motor and the AS5510 operate on 3.3 V input. The motor drive ASIC, a microprocessor and firmware are all contained within the endoscope head. This gives us the shortest communications loop, with the I2C interface providing the high speed and bandwidth to maximize system response. Input to the device is in the form of high-level motion commands provided from an external computer system using an RS485 or similar interface designed for low interference or attenuation over longer distances. 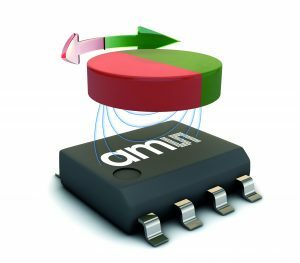 The combination of very small size and on-chip ADC makes the ams sensor ideal for miniature positioning systems. This novel implementation extends the sensor’s usefulness to new miniature optical applications requiring off-axis, non-contact rotary position sensing. Learn more about New Scale Technologies’ capabilities for custom engineering and micro-mechatronic system development .